First performed on ice in Colorado Springs, 1948. The dance starts on count 1 of a measure of music. The first step skated must be step #1. The opening steps must be either 8 or 16 beats of music in duration. ​ Reverse “B” position is required on steps #1 through #9. During steps #10 and #11 (RIF-LIB open dropped mohawk turn), the position changes to Side “B’”. This position is retained through step #14 (ROB). The position changes to Reverse “B” during steps #15 and #16 (XF-LIB - RIF open held mohawk turn). Both variations of the position should use the thumb pivot grip. 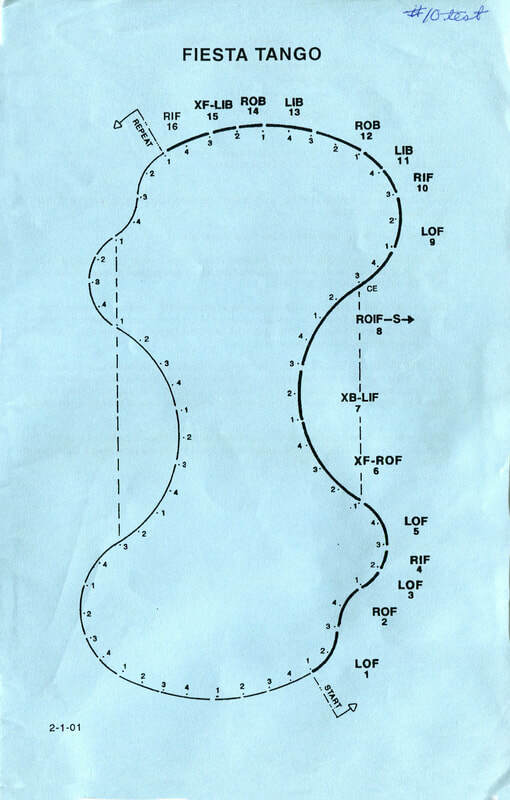 Every step of this dance, except the cross steps (steps #6, #7 and #15) and the second half of both mohawk turns (steps #11 and #16) must take the floor in the “parallel and” position. Steps #7 and #15 are crossed chassés. 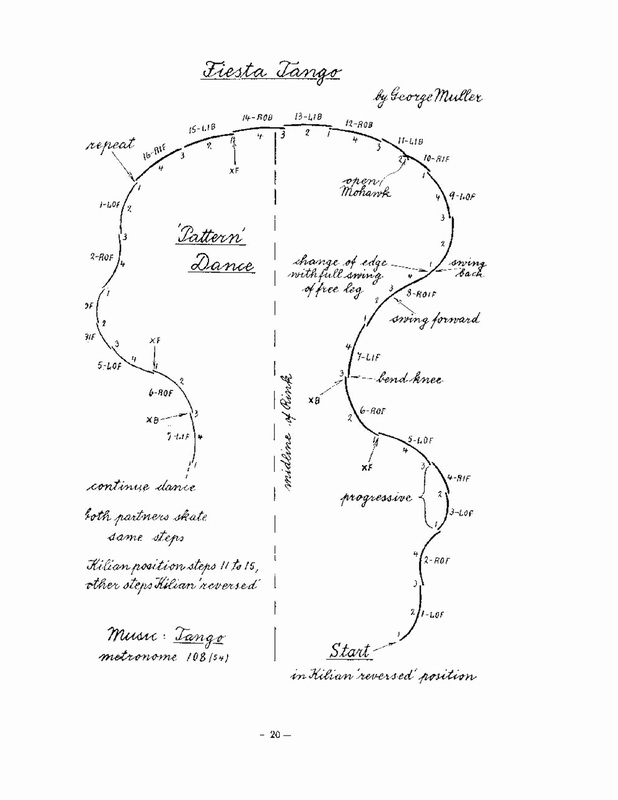 The takeoffs for these steps must be crossed-foot, crossed-tracing, close and parallel. 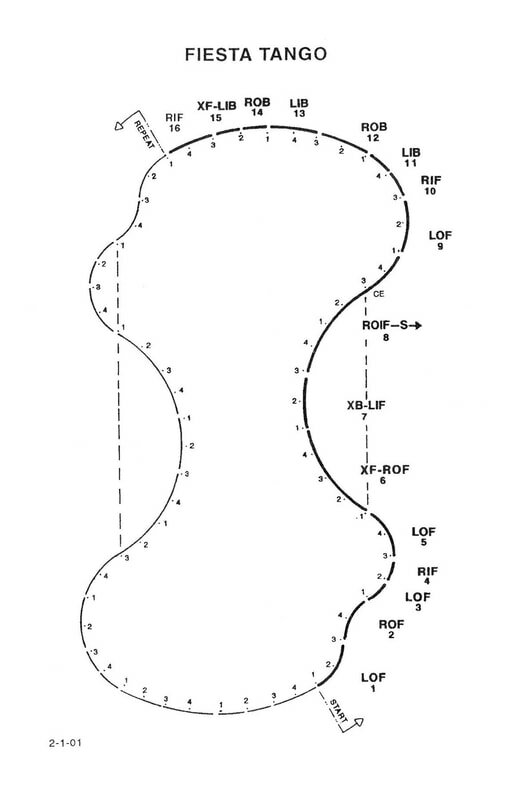 Step #6 (XF-ROF) is a cross roll. The takeoff for this step must be crossed-foot, crossed-tracing, close and angular. There should be no rockover preceding this step. The free leg movement during this step is optional. 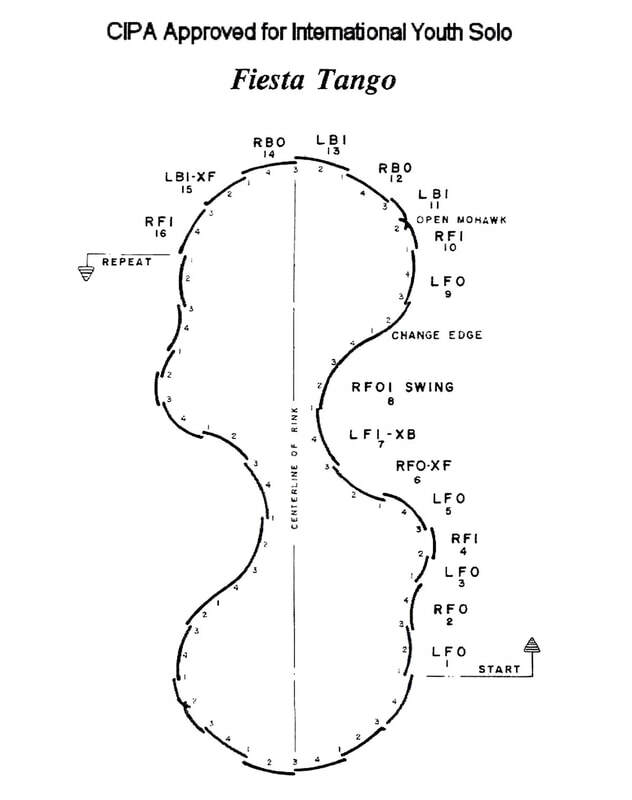 During step #8 (ROIF Swing) the free leg is swung forward on the third count of the step (musical count 1), returned to a position alongside the tracing skate on the fourth count of the step (musical count 2). The change of edge and extension of the free leg to the front both occur on the fifth count of the step (musical count 3). 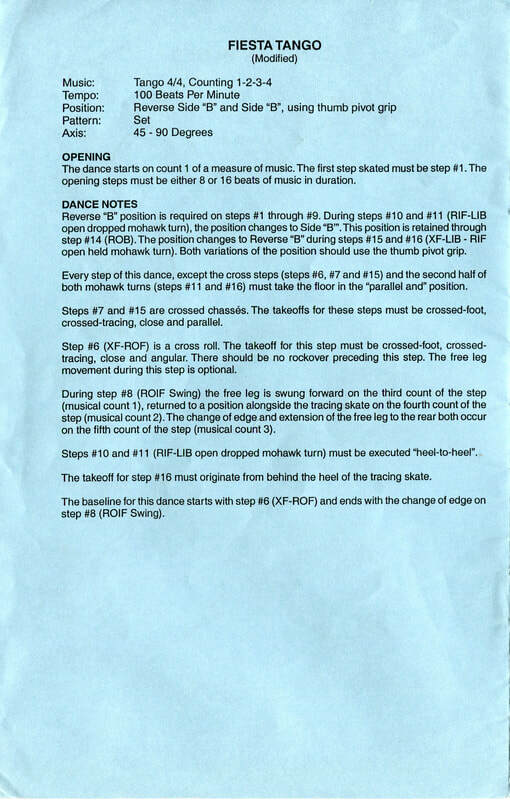 Steps #10 and #11 (RIF-LIB open dropped mohawk turn) must be executed “heel-to-heel”. The takeoff for step #16 must originate from behind the heel of the tracing skate. 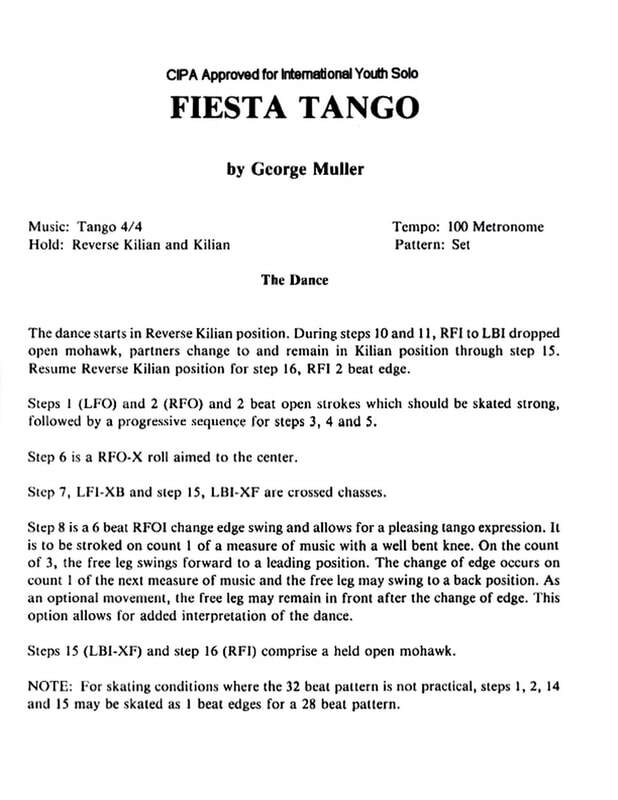 The baseline for this dance starts with step #6 (XF-ROF) and ends with the change of edge on step #8 (ROIF Swing). author's note: "modified" version - includes; step 6 lengthened from 2 to 4 beats, steps 14 and 15 shortened from 2 to 1 beat. Dance remains 32 beats long until repeating for the other 1/2 of a full circuit around the rink.